Welcome to our climbing paradise, a place where dreams of climbing really come true. Paklenica climbing área covers all disciplines of dry-weather climbing. From bouldering to big wall. From 3a to 8b+. It’s all there! 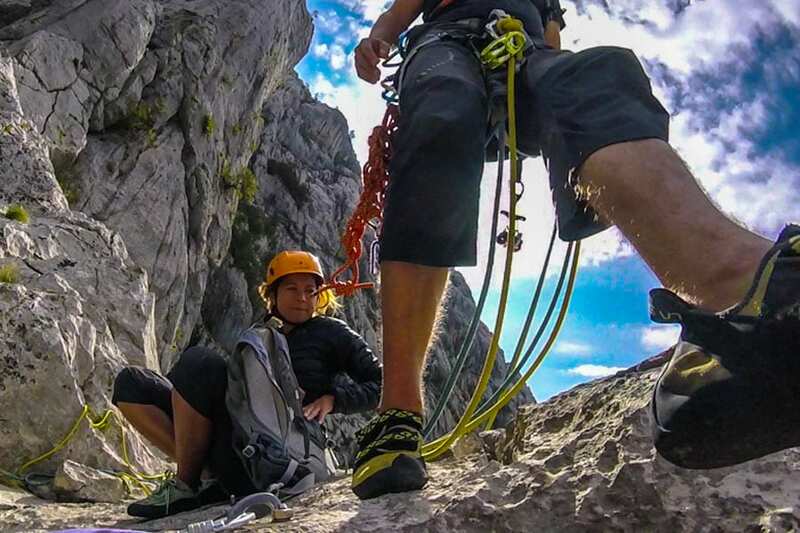 ADV proudly presents the Mediterranean climbing adventure provided by the great canyon of Paklenica! 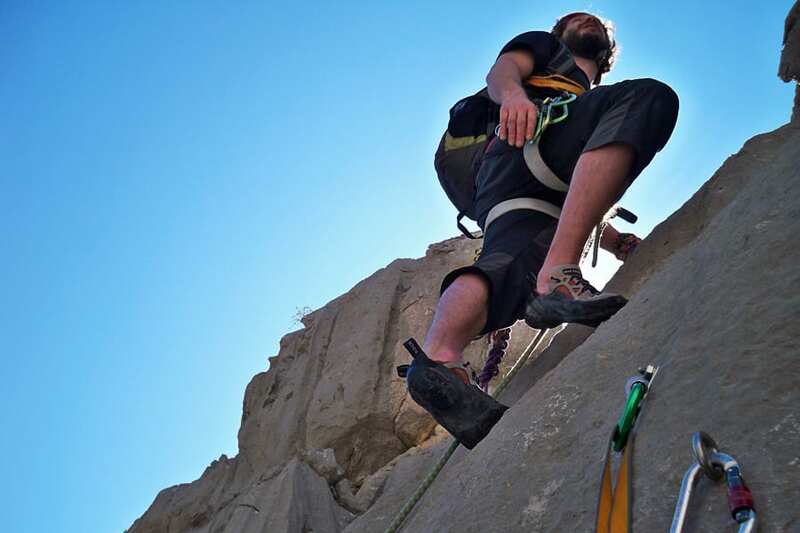 As an ever-seeking adventure enthusiasts, we find multipitch sport climbing just the right adventure for you. An opportunity to experience the beauty and the spirit of national park the way no ordinary tourists do, but only the climbers. What exactly is a multipitch sport climbing? In contrary to a single-pitch sport climbing which emphasizes comfort in order to maximize athletic performance, multipitch climbing means going all the way up to reach the summit of a crag. But, since the routes we’ve chosen for you, are all very well bolted, it still is a sport climbing, meaning as safe as possible in terms of dealing with mother nature. The routes are all from 100 to 200 meters long, ranking from 3a to 6b. The shortest route (Prijatelju moj 3+) has only two pitches and is suitable for guests with no climbing experience. 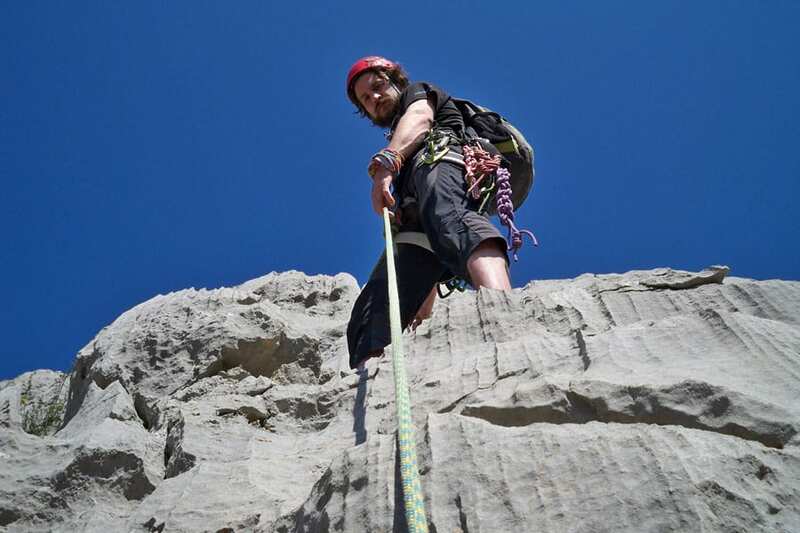 Though every ADV adventure - no matter how experienced you might be - starts with a short course on gear, knots and belaying technics, harder and longer routes are customed exclusively for guests with at least basic outdoor climbing experience. While climbing, you will be governed by an ADV guide whose job is to lead all the pitches and to belay your climb over an autoblocking device system – a system that cathes your fall automatically, minimazing the length and hardness of an impact. It doesn’t mean you will surely fall, most probably you will not, it just means that on behalf of a belayer, your fall will be safe. In case you decide to omit the given instructions, you are then on your own and all responsibility goes on your behalf. The trust and companionship is what it takes for a successful climb. Please, let your guide deal with all decisions! Even when it comes to estimating of what you might be capable of. It’s not ment to offend you in any way, but to secure your climb and get the most out of your adventure day. So, stay focused, don’t lose your nerve and enjoy the time of your lives! After a short introduction, we’ll head toward a parking lot. Your car will be parked five minutes walk from the climbing area. Make sure to bring enough water and food (sandwiches, snacks, fruit) for the day. We’ll talk a little bit. Your instructor wants to know every detail of your previous climbing experience. Have you ever climbed outdoor before? Did you lead or top-ropped? Have you belayed? Ever climbed a multipitch route? Stuff like that. But, no matter how experienced you might appear to be, you’ll take a short course on gear, knots, belaying and communication standards. Based on previously determined information and skills presented, instructor will choose a route for the day. Please allow your instructor to take the judge, the jury and the executioner role and make all the decisions on your behalf. It’s ment for your safety exclusively. All the routes are in 15 minutes range. 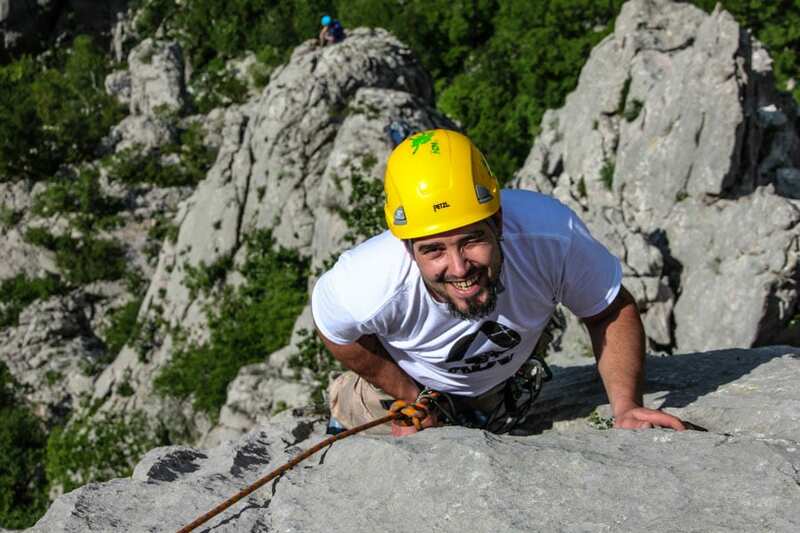 While approaching, you will get to know a little about the park, the routes and the history of climbing in Paklenica. Building a partnership is crucial for climbing a multipitch route, so pardon your instructor for telling a bad joke once in a while. Things are getting serious now. Once you start climbing, instructor needs your full attention. His job is to lead all the pitches and secure your climb. Your job is to belay the leader and to send a route as a second. That way the outcome of your possible fall is minimized. The bad thing is that sometimes you won’t be able to see nor hear each other, so the communication standard is important to be set up perfectly. Some of the routes have an easy walking-down descend, others require rappelling. A joyful experience by all means, sliding down the rope into the heart of a canyon. But again, full attention ON! Please, follow the exact instructions given beforehand. Your adventure is not over till you get back to the canyon. Once the risk is all gone, it’s time to chill. Maybe a cold beer might suit you. Your ex-instructor, now-partner is happy to hear all of your impressions. Maybe even plan another ADV adventure for tomorrow.